Maybe you got a new iPad Pro for Christmas, or perhaps you saved up your money to treat yourself in the New Year. However you got your Pro, you want to flaunt it. With an A9X Chip and iOS 9, it’s a hardworking handheld device known for its fast and dependable performance. It can handle more apps than ever before, which means you can use your Pro for more. Its four audio speaker system and 12.9-inch Retina display means you actually want to catch a movie in your bed or on the train. (Remember your headphones!) But all of this is tucked away within the confines of the typical Apple design. 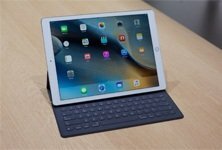 No one but another Pro user will know how great your iPad is over other devices. To make your iPad as singular as it truly is, get a customized skin. A customized skin makes up for what the Pro lacks, which is quite a lot in terms of style. Space grey, silver, and gold are your only options, a selection which begs the question of what the difference between space grey and silver really is. With arguably only 2 colour choices, chances are yours looks identical to thousands of other Pros. And if it weren’t for the huge display (over 3 inches larger than the next biggest iPad), your Pro would look like any other iPad, regardless of colour. An iPad Pro skin changes all of that. Mahogany, zebra wood, black leather, and red carbon fiber are only a handful of the textures that they come in. And you can find a ton more textures as well as true colours online where you can combine surfaces until you find a design that’s uniquely ‘you’. Online is the easier way to shop for these iPad Pro skins, especially when you want to show off your individuality. At a store, you’ll only ever find a pre-made skin that’s been designed by someone thousands of miles away from you, with no real understanding of you or your style. Online, you can search out some of the best build-a-skin apps like what you can find at dbrand.com/shop/ipad-pro. Click through the colours and textures for the front and back pieces. You can even see (in real time) what colour pen would complement your unique design perfectly. Yes, that’s right – pro skins cover even the Apple Pencil. Wrap up your device with an iPad Pro skin and it will finally look like the special and distinctive iPad that it is. On top of it all, in addition to a customized style that’s individual to you, quality made skins provide unparalleled protection that will keep your Pro last longer – scratch-free. So head to better skin providers online and start look for the best way to flaunt your Pro.